I like banana to be firm and sweet. But when we bought 6-8 bananas at a time, after 2-3 days they become blakish skin and very much soft. I never ate those bananas. But my mom never through away those bananas. She mashed those and make sweet fritters with them. Here I'm sharing my mom's sweet banana fritters recipe. 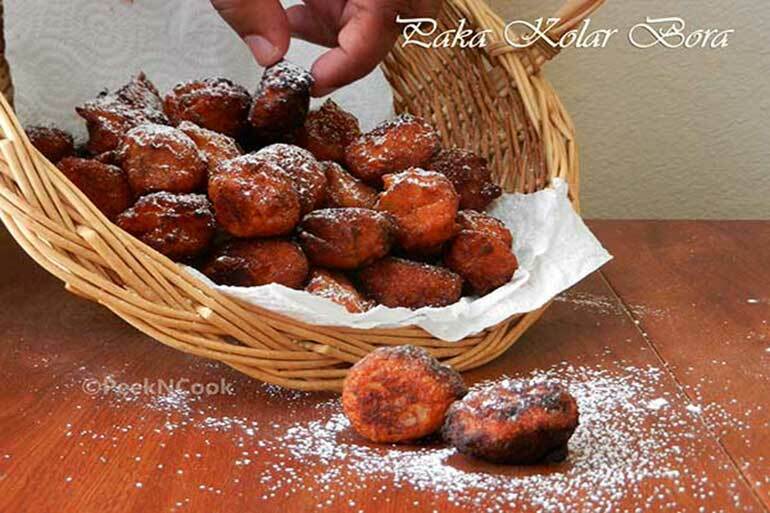 Ripe Banana Fritters is made with Very ripe bananas , garted coconut, sugar and Maida & rice flour. Mashing the ripe bananas with hand and mix the other ingredients at a time and deep fry them on hot oil. This fritters are very tasty. They could be eaten as they are or by dipping in Maple Syrup or Honey. Powdered sugar can be sprinkled on the fritters. Ripe Banana Fritters is made with Very ripe bananas , garted coconut, sugar and Maida & rice flour. Take a bowl and put the mashed ripe banana, grated coconut, salt, sugar, maida & rice flour into it and mix them to make a thick batter. Now heat oil in a pan or wok. Put one drop of the batter to check the oil is hot or not. If the drop comes up right away, the hot is ready. Now drop the batter by a tablespoon . Do not over crowd the pan. Fry them till golden brown, turning them side by side and place on paper towel. Serve hot or cold after dusting some powdered sugar.